Youth information and counselling, perceived as inherent element of services supporting youth, is a historically relatively recent phenomena. It used to be directed at keeping youth at the “right path” and centred around morality or at providing psychological help to the young people in personal crisis. Starting from 1960s, the youth information and counselling has shifted towards “generalist” concept, i.e. towards providing youth with user-targeted information and counselling in all areas of interest to youth taking into account their real need. In other words, youth information and counselling systems have recognised this area as a matter of human rights, which enables young people to improve their social status on the basis of their needs and aspirations. In the introductory part this paper identifies access to quality information as a prerequisite for enabling young people to become self-fulfilled, happy and productive members of their societies. In this respect, a review of youth information policies is also presented, as well as data on youth attitudes towards usage of youth information and counselling systems and insights into youth mobility. These insights are accompanied by identification of crucial stakeholders and instruments in youth information and counselling. It is elaborated why stakeholders in youth information – both government-lead and nongovernmental - bear responsibility to create accountable and appealing youth information and counselling systems that respect young people as both users and producers of information and will in building their autonomy. states, trying to encompass varieties of activities that aim at informing the youth and giving them opportunities to express their attitudes and worldviews. 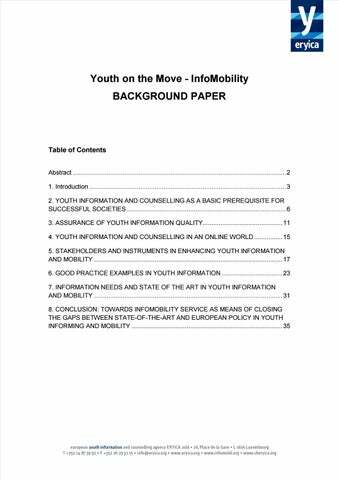 In the final section of the paper we identify major drawbacks and advances of European youth information and counselling system, and present the Youth on the Move – Infomobility project as the main theme in closing the gaps between state of the art youth information and counselling and goals set by the European policy guidelines. raising awareness of risks in usage of different information sources and methods. The generalist youth information covers all relevant subjects for young people: 1) education; 2) jobs and career; 3) leisure time, sports and cultural activities; 4) legislation relating to young people; 5) housing; 6) money issues; 7) health issues; 8) facilities and services for young people in the local area; 9) holiday and travel and 10) volunteering and European and international opportunities. The recommendation followed a “generalist” by setting the focus of youth information and counselling to “all sectors, without exception”. At the same time, it promotes young people’s autonomy and complete freedom of choice, without any discrimination or ideological or other influence. The value of this document also lies with its target groups, addressing not only decision makers and politicians, but experts in the field of youth and youth workers as well. participation: ensuring young people are consulted and more involved in the decisions which concern them and, in general, in the life of their communities”. Mobility (2006) 12 lists ten principles implemented on a voluntary and flexible basis, where information and guidance being one of them: “every candidate should have access to clear and reliable sources of information and guidance on mobility and the conditions in which it can be taken up, including details of the Charter itself and the roles of sending and hosting organisations”. other European networksâ&#x20AC;?. Moreover, the European Parliament resolution on recognising and promoting cross-border voluntary activities in the EU (2012)17 called â&#x20AC;&#x153;the Member States to ensure legal certainty for volunteers, not least with regard to insurance issues, so that the various regimes in the different Member States encourage cross-border volunteering, and also to ensure better provision of information to volunteers in connection with their rights and the regulatory and institutional arrangements pertaining in the various Member Statesâ&#x20AC;?. These considerations take us to the following component, substantial to youth information and counselling, that could enable and empower them to become productive and satisfied members of their societies. particularly with regard to […] improving the link between information and counselling with the aim of encouraging a learning and capacity-building process among young people on how to obtain, select and evaluate information in order to become informed users of information; encouraging greater use of the ‘new media’ such as the Internet, mobile phones, video, cinema etc. in youth information in order to reach as many young people as possible”. all elements in the youth information and counselling network should closely cooperate with other youth services and structures. Shortly after the revised European Youth Information Charter was adopted EYRICA recognised a need for defining criteria for assessment of the national youth information policies. As a result, ERYICA member organisations formulated a set of 12 indicators for the assessment of national youth information policies in 2005 (Indicators for a National Youth Information Policy20) 1. Governmental Role – the Government should consider youth as an important and inherent policy task , for which it needs to develop a national policy (or strategy) that seeks to develop a comprehensive, coherent and co-ordinated approach. 2. Youth Information Legislation – the provision of youth information services should have a legal basis in the relevant youth legislation. 3. Stable Funding and Staffing – youth information services should be adequately funded and staffed, on the basis of an annual (or pluriannual) work-plan and budget. 4. Equal Access for All – youth Information service should be accessible to all young people. 5. Regional and Local Dimension – the national youth information policy (or strategy) should have a regional and local dimension in order for youth information services to reach a maximum number of young people. Regional and local authorities should be actively involved in supporting the provision of youth information. 6. Scientific Research and Expertise – a youth information policy (or strategy) should be based on a sound knowledge of the information needs and expectations of young people. 7. Innovation – youth information policy and services should promote innovation and encourage reflection by youth information workers and by young people on how to develop creative ways of meeting already recognised and new needs and challenges. 8. Participation of Young People – promoting the active participation of young people in youth information work should be an important element of the youth information policy (or strategy). 9. Cross-Sectoral Co-operation – a comprehensive and coherent youth information policy will require consultations and cooperation between a wide range of actors, including governmental departments, official youth services, voluntary youth organisations and young people in general. 10. Quality of Services – a youth information policy (or strategy) should include measures to maintain and develop the quality of the youth information and counselling services provided to young people. 11. Training – a basic and continued training of youth information workers should be a priority component of a national youth information policy. 12. Diversity in the Delivery of Information – synergy of traditional and new media and technologies in bringing relevant information to young people should be met. experiences and practices gathered in the ERYICA YIntro-Manual and calls to follow CRAP recommendation. In other words, information should be: C – Clear (quality information is clear information); R – Relevant (relevant to the needs of young people); A – Accurate (clear, straightforward and appropriate to the real needs) and P – Pitched (suits the needs and abilities of young people). Online Opportunities 1. 2. 3. 4. 5. 6. 7.
make use of new, creative and interactive ways to disseminate information, communicate and exchange with young people and all other stakeholders”. 5. Continuous improvements of the existing policies and their adaptation to the changing realities of young people’s lives underline a need for management of human resources in youth information. Council Resolution on implementing the common objectives on the youth information (2005) 28 pointed at a need of “continuous training of those involved in youth information with regard to content, most suitable methods and use of available technology, so that young people can recognise quality information easily”. Continuous training has to be supported by efficient structure and organisations whose network efficiently follows the existing and propose new strategies in the field of youth information and counselling. After the establishment of ERYICA in 1986, the 1990s brought establishment of several other networks in the field of youth information: the European Youth Card Association YOUTH.net 31 .
streams from its unique position where youth-related information on the national level is matched with corresponding information on the European level. Similar instrument is presented by the SALTO-YOUTH.net35 â&#x20AC;&#x201C; a network of 8 Resource Centres established in 2000, working in the field of youth work and training. In 2004 EYCA, Eurodesk and Salto signed a declaration for cooperation, which was followed by several jointly organized events related to the development of youth information and counselling. Another card relevant in this context is the Youth on the Move Card36, whose goal is not to replace nationally accepted cards, but rather to build on and cooperate with these cards, possibly in the form of a label. This label could add real European value by offering more discounts, access to information and online networks, and new features such as smartcard technology to the European youth aged 13-30. Direct funding for activities managed primarily by youth can be accessed through the European Youth Foundation (EYF) 37 , a fund established in 1972 by the Council of Europe to provide financial support for European youth activities. In 40 years (since 1972) it managed to fund more than 300 000 young people, aged between 15 and 30 making nongovernmental youth organisations or networks empowered for achieving their goals. Speaking about the youth non-governmental associations, the European Youth Forum38 also has to be mentioned as an umbrella association of national youth associations or councils, has a prominent role in youth information and counselling through various activities, policy analysis and information materials. important to mention some of the programmes in this field. First of them, the Comenius39 actions, as part of the EUâ&#x20AC;&#x2122;s Lifelong Learning Programme, grew from the Socrates programme (which ran from 1994-2006) in 1995, with an aim to help young people and educational staff better understand the range of European cultures, languages and values. They also help young people acquire the basic life skills and competences necessary for personal development, future employment and active citizenship. Comenius aims to: I) Improve and increase the mobility of pupils and educational staff across the EU; II) Enhance and increase partnerships between schools in different EU Member States; III) Encourage language learning, innovative ICT-based content, services and better teaching techniques and practices; IV) Enhance the quality and European dimension of teacher training and V) Improve pedagogical approaches and school management. Erasmus 40 became part of the EU's Lifelong Learning Programme in 2007, covering new areas such as student placements in enterprises (transferred from the Leonardo da Vinci Programme), university staff training and teaching for business staff. Erasmus is the perfect example of a European success story: close to 3 million students have participated since it started in 1987, as well as over 300 000 higher education teachers and other staff since 1997 (this type of exchange was also expanded further in 2007). The annual budget is in excess of 450 million euro; more than 4 000 higher education institutions in 33 countries participate, and more are willing to join. Erasmus for students 41 provided a framework for more than 2.5 million students for experiencing international mobility in more than 4 000 higher education institutions in 33 participating countries. European Skills Passport 42 is one of thirteen actions launched under the Commission's Agenda for New Skills and Jobs 43 , which enables people to improve the presentation of their CVs by bringing together their educational and training certificates in one place, providing evidence for the qualifications and skills declared in the CV. It is available for free in 26 languages on the Europass portal where an on-line editor helps users to create their individual passports. It complements the Europass CV which is used by more than 20 million Europeans. funding â&#x20AC;&#x201C; for both young jobseekers and businesses interested in recruiting from outside their home country. This section will present a couple of good practice examples led by the European networks, two good practice examples in the area of national counselling organisations and several projects in youth information (with an emphasis on general information and counselling and information on mobility). The first example to be mentioned is a seminar “Mobility of young people – Opportunities and obstacles for cross-border volunteering for young people, particularly with fewer opportunities” 56 , organised by the Youth Partnership between the European Commission and the Council of Europe in the Field of Youth57 in 2011. This seminar gathered stakeholders from various areas – from politics and policy to research, youth work and non-governmental sector. They were provided with state of the art in area of youth mobility and related policies, and were given a chance to present their experiences and findings. Another European-wide initiative is a campaign “Information Right Now” 58 ! candidate country for the EU enlargement. media (TV and radio) production, and successfully administer the largest noncommercial website for young people in BiH62. Some of the services offered to the youth are: “info desks for youth” (IDeMo! )63, web portal for youth64 and youth mobility portal65. Their newest undertaking is foundation of the Social Innovation Incubator and Open Space for youth, which resulted in 120 info events with more than 2000 participants in eight months since their beginning. They also achieved employment of 30 young people through five start-ups and fifteen young people found a job as employees. This organisation led by youth proves that high goals can be achieved without strong institutional support, and it suggest that even more significant results could be achieved if governmental institutions provide support to such initiatives. The following are nine examples of good practices implemented in the EU Member States and nine examples from the non-EU Members. All projects are presented in alphabetical order of the country name. Selected examples were identified as those that excelled in one or more criteria: 1) provide information; 2) make young people and/or their wider community aware of youth position and 3) make people more mobile. teachers, social workers, trade union members, young leaders and youth activists. “Youth info point“ 69 (Bosnia and Herzegovina) offers a list of all information services and data sources available in Bosnian municipalities, provided via interactive online map to youth. Since the content was created by young people, the data sources and services are easily accessible and categorised in groups that are clear and appealing to the youth. “Travel to Europe in 2013”70 (Bosnia and Herzegovina) started by the Youth Mobility Portal71 in 2008 on an annual basis provides 25 university students with travel grants in Europe for 22 days. Informed – Included (Croatia) 72 connected 16 young beneficiaries of Youth Information Centres from Malta and Croatia, with the purpose of exchanging experiences, thoughts and expectations on youth information and social inclusion. "Mobility, information and counselling of youth"73 (Croatia) was coordinated by the Community of youth info centres 74 , with an aim of improving youth information and mobility through awareness raising campaigns and a survey on 1200 youth. Insightful results of the survey on youth experiences, values and needs were followed by public consultations that gathered 40 participants (30 young people 10 youth workers) per region (total number of 160). Dialogue in youth policy 75 (Finland) is a project run by the Government of Finland, which seeks to develop a tripartite model of dialogue in youth policy between decision-makers, youth work (including youth workers, young people and youth organisations) and youth researchers. Video Series 76 (France) increased the visibility of youth Information services across France by obtaining wide media coverage and promotion at regional and local level. It was started by CIDJ â&#x20AC;&#x201C; Centre d'information et de documentation jeunesse in November 2012, and it managed to attract 731 viewers of the content aimed at youth information and inclusion in six months. down their questions about topics that interest them by sending the postcards (free of charge) back to the Youth Information Centre. “Knowledge and Sports among Young People”80 (Former Yugoslav Republic of Macedonia), is a youth event coordinated by Youth Information and Counselling Centre INFO, the Youth Council Prilep and Youth Multicultural Community and managed to gather 3000 young people. It ran under the motto “Knowledge and sports among youth”, covering two main actions: leisure activities for youth and dissemination of information on the INFO SEGA youth information centre and services. “Passport to Europe”81 (Kosovo), implemented by the Kosovar Youth Council82, provided youth (aged 14-19) with the conditions and the opportunities to acquire knowledge on the main European institutions. Knowledge acquisition was accompanied by raising awareness of European Integration Process. A book «You are right! A guide trough law and all the rest»83 (Montenegro) was directed at publishing and distributing two editions of the book by NGO Association for Democratic Prosperity – Zid84. This book was designed as a reliable and attractive guide in what young people (and media, NGOs, public institutions, schools, etc.) can find interesting in areas of education, employment, family life, housing, finances, health, safety, state and politics, judiciary, minority, mobility and leisure time. and with young people, with an aim to bring organisations and professionals together in providing a more effective service for young people. My Town, My Europe89 (Spain) gathered 20 active participants and a lot of other young people in sharing personal experiences and values among young people through creation of videos. They were given an opportunity to check the importance of being European and the possibilities they have thanks to the European diversity and richness. As a result, the participants had the opportunity to broaden their perspectives by challenging their attitudes towards people from different cultures and regions. “Redes de Jóvenes”90 (Spain) project invited young people to add themselves as the Messenger contact of the Youth Centre. Messenger does not serve only as a channel for sending and receiving messages but also as a tool for active participation of users in creation of the contents offered by the Youth Centre. TV show „I want you to know“91 (Serbia) is coordinated by the Youth Office92 in Belgrade and performed at the "Studio B" TV. It started in 2010, with a goal of informing and educating young people through entertaining content, covering wide area of topics relevant to youth – from education, training, employment, volunteering, and mobility, ecology to promotion of young talented experts, artists and scientists. beneficial employment of international networks and funds. And at the end, there has to be noted that countries whose youth information services have just started their integration into the European policies and practices in this field (like the SEE countries) mostly focus on information campaigns aiming to inform young people on their basic rights, while the organisations from the EU Member Countries often take different approach â&#x20AC;&#x201C; art performances for instance. Good practice examples gave us insights into various practices in youth information and mobility at national level. Next section will present some studies based on aspiration to identify European trends in youth information and mobility. and individualised treatment when interested in education, career path or health. evaluate the sufficiency of information available from their home university prior to their studies abroad on average as 3.27, while satisfaction with information provided by the host university is on 3.77. It seems that Internet is less used for information on educational mobility among students, most of them learn about educational opportunities from their peers (43.7%), followed by those who heard about them from people working in institutions included in international relations and education (19.9 %) and those whose teachers proved to be helpful (15.8 %). Only smaller share of Erasmus grantees used Internet (7%) or student organisations (2%) as their primary source of information. Flash Eurobarometer 319b “Youth on the Move” shows that employment driven mobility is less prominent among young people – only 9% of respondents reported to have stayed abroad for work related purposes, while only 2% were volunteering abroad and 77% have never stayed abroad. Young people from Ireland and Iceland are the most mobile in this respect – almost 40% of them have an experience of working abroad, while this kind of mobility is the least present among young people in the Netherlands (14%), Italy (12%) and Turkey (5%). When listing the reasons of their immobility, young people are inclined to “lack of interest” (28%), “lack of funding” (20%), family commitments (12%), “lack of information” (6%) and “lack of foreign language skills” (5%). However, recent economic crisis has forced young people to be more mobile when seeking employment. EU Youth Report 201297 in its chapter on mobility reveals that between 2010 and 2011 outgoing migration increased by an average of 45% from southern EU Member States – by 52 % from Spain and by 90 % from Greece. Sadly for their homeland economies, the majority of migrants were well educated young people with qualifications in the tertiary sector. Following “Youth on the Move”98 initiative, a survey on the Youth on the Move card initiative was conducted in 201199. Youth on the Move, as one of the seven flagship initiatives, aims to support the priorities of the Europe 2020 Strategy, while raising "the overall quality of all levels of education and training in the EU, combining both excellence and equity, by promoting student mobility and trainees' mobility, and improve the employment situation of young people". The online survey, supported by Eurodesk, Erasmus Student Network, European universities and the EU representations in the EU Member States and EU delegations, received 3027 online responses. Additionally, several stakeholders submitted position papers in response to the survey. It can be sad that the survey was successful as 91.5% of all respondents are younger than 30 years, with majority respondents in 19-26 cohort. A need for youth card was strongly pronounced by the results – almost 92% of all respondents indicated they have had a student or youth card (mostly more than 1 card) at one point in their lives. Moreover, 75% holds opinion that a student/youth card definitely supports the mobility of young people. The most important issues in the area of youth information and counselling can be grouped in seven areas: 1. limited outreach – limited awareness of young people on existence of the youth information centres and/or their services; 2. lack of interest of young people to approach youth information services in a case of need; 3. personal traits or position of individuals that make them vulnerable or ashamed or their situation and therefore hesitant to ask for help; 4. lack of funding that could provide long-term sustainability; 5. lack of support from local, regional or national government; 6. lack of expertise among workers at the youth information centres; 7. lack of insight into youth standpoint and their aspirations and needs. 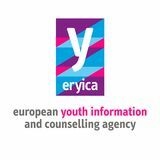 3. long tradition of youth information and counselling, with expertise that is shared via various networks; 4. support structures, such as ERYICA, EYCA and European funding schemes. At the current stage of youth information and counselling development Europe needs interconnection of current policies, practices and stakeholders. A critical amount of efficient elements and stable structures has been achieved and they have to be merged in a way that supports current good practice examples to furtherly excel and to enable current low-achievers to catch-up and develop efficient systems. The Youth on the Move – InfoMobility (YoMIM) project101 with “the overarching goal […] to innovate and to enhance youth work whilst fostering synergies between the main actors in the field of youth information and counselling, paying special regard to cross-border European mobility”102, is the kind of project that will enhance interconnection at the European level. existing youth support structures in the field of youth information, a transversal youth work tool whose poignant role has been recognised in the “Youth in Action” programme and in the “Renewed Framework of Cooperation in the Youth Field”. The ultimate goal of the project is to enable young people, regardless their education, social background, country of residence or any other feature, to feel “home away from home”, thus enabling them to be self-fulfilled, happy and productive members of European society.